After over 30 years of building various styles of furniture using mostly power tools, jigs, fixtures, etc. I've decided to pull the plug in my shop. 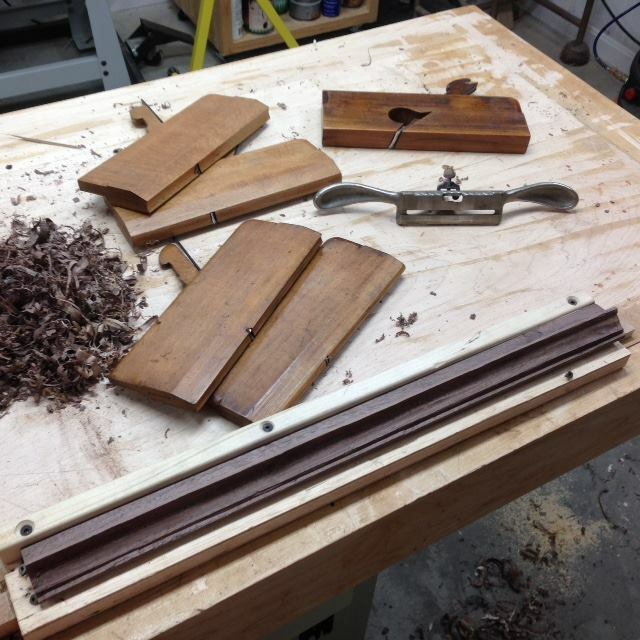 I was given a Stanley block plane that was rather dull. I had no idea how to sharpen it. Went to a local Woodworking Show and bought a Tormek Sharpening System, sharpened that blade, and never looked back. To me, that one sharp tool opened the door to a handful of wonderful tools. now I do my blades with Arkansas stones and oil, works great every time. Over time I started to use more hand tools and saws in my work but always relied on the table saw band saw, and planer for that 'quick' sizing of stock. 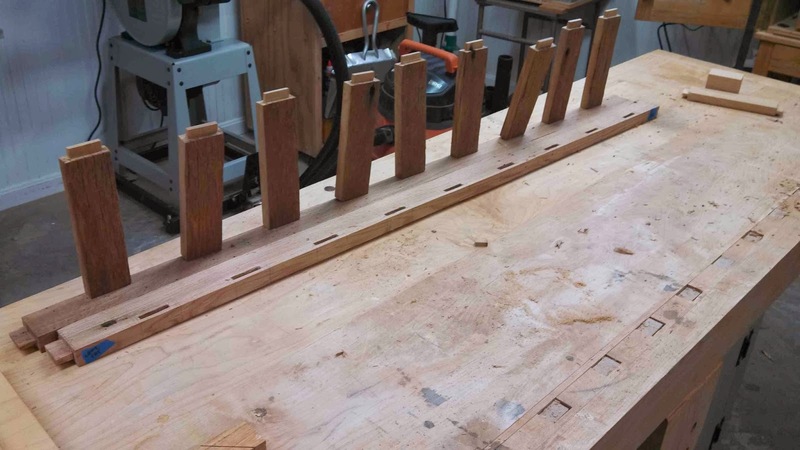 I've though about this unplugged approach for a while and I found the inspiration to make the move after reading Tom Fidgen's books and most recently Joshua A. Klein's Mortise & Tenon magazine to unplug, take the time to feel more connected to my work. With a few exceptions, it h make the as always been more the journey than the destination, I suspect this to be no difference. I'm looking forward to it. The plan is to first move anything with a plug out of the shop to the other side of the wall. 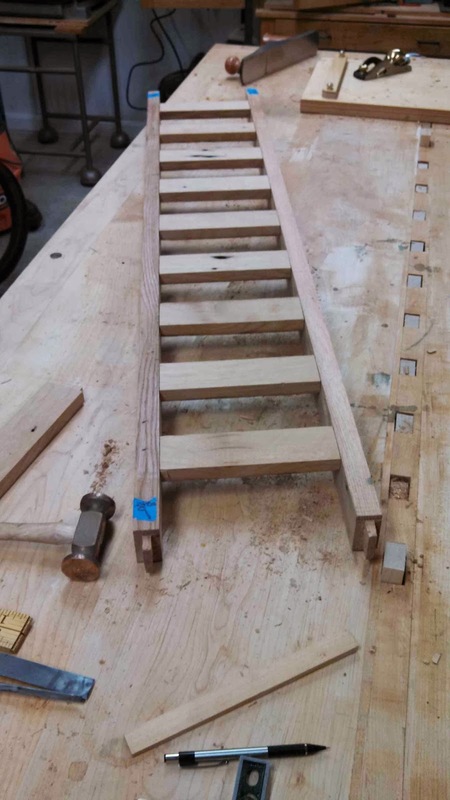 I will have my Shaker Bench I built, a nice carving bench I purchased years ago, and will reorganize the saw till, plane till, and get everything relocated in one area that is easy to reach. 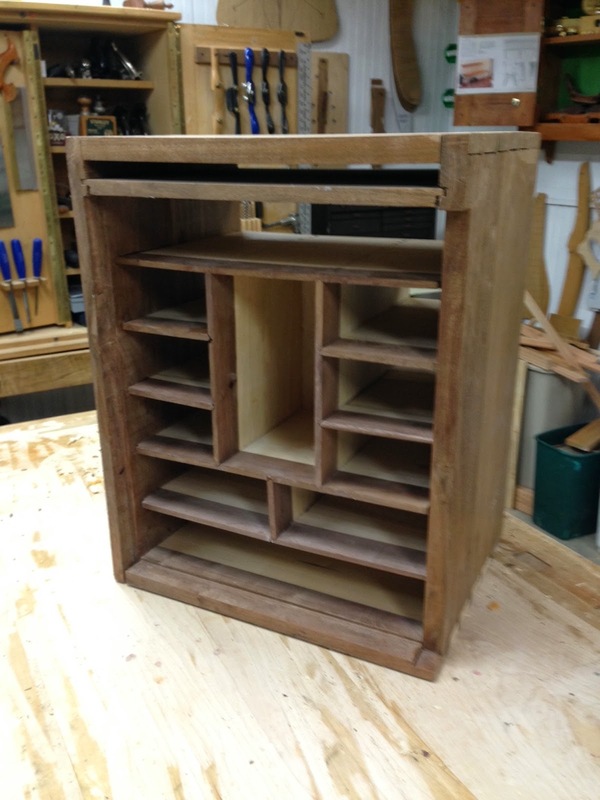 I have a project from Tom's book to start on as well as finishing the Spice Cabinet shown in other posts. My inspiration and guidance during this next phase of my journey will be the M&T Manifesto. The seven tenants summarize the distinctive and vision of Joshua's publication. You can find a description of each one in the first issue, you will be inspired. I have started to clean up some of the posts from the past but will keep those posts that were not fully unplugged. Over the next few post I'll keep you updated on the progress. After some time off for some travel and a few small projects, finally getting back to the Spice Cabinet shown in some previous posts below). 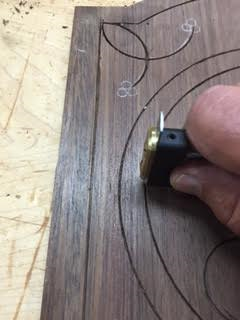 Decided to get on the Line & Berry inlay for the door panel before starting to dovetail the many interior drawers. 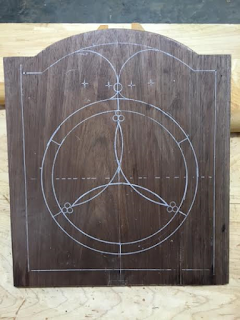 The pattern is traced out on the back side of the panel. 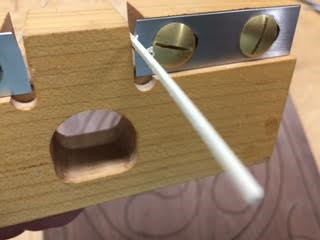 Once the pattern is complete, start scribing the lines to accept the stringing. A little trial and error here as to how deep the grooves need to be, sneak up on it a few times and it'll come easy after that. A few different sizes of old dental picks will help clean the scrap trimmings out of the grooves. The holly stringing needs to be sized before gluing in the grooves. A few passes in this tool does the trick. Some of the tools used to scribe the lines. 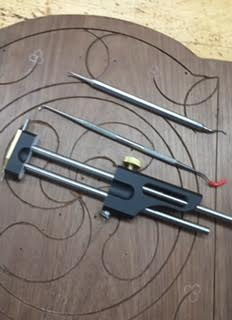 I purchased a set made by Lie-Nielsen for this work, I've seen others made these tools, I'm just not that crafty. If you purchase, get the extension for the scribe tool to get to the larger radii. I made some progress over the past couple of weeks, that was to build the back panel and to start on the base and crown moulding. I accomplished both but not without some trial and error. I was determined I was going to make these moulding by hand as I don't have a lot of router bits and sure don't have any that match these profiles. I also resisted using the table saw to hog out a lot of the waste material. Material is walnut. The tools I used to make the moulding are shown below. A pair of #6 and #8 hollow and rounds, a 7/8" rabbet plane, and a Stanley #66 beading plane which came in handy to cut the bead on the face of the crown moulding. Base moulding shown in the tray held by a bench dog and tail vise. 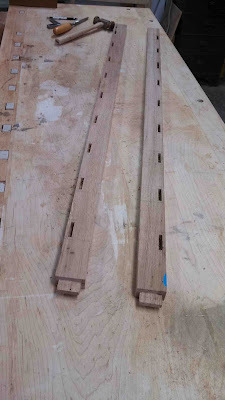 The back is a splined panel made of 1/4" Ash and slides up and into the back dadoes and rabbets. This is an interesting feature. By removing a drawer and reaching in the front, you lift the back and push out the bottom to remove it. This reveals a secret compartment. These compartments were a popular design feature in 18th century furniture. The mouldings were a challenge to make as I had never tried doing them by hand before. Sometime ago I had purchased the book shown below with the intentions of learning how to do just that. 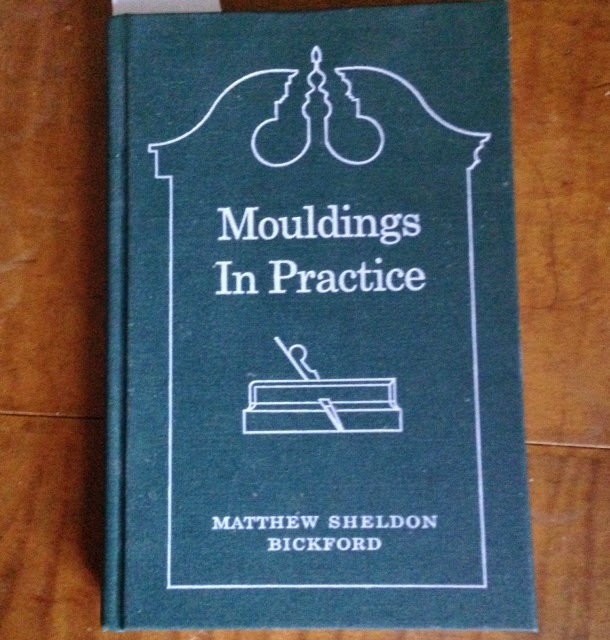 This is a very well written and easy to understand book by Matt Bickford and it removed a lot of the mystery of the process of making various profiles with moulding planes. It's not as easy as it looks but not impossible. As with most tasks using hand tools, patience truly is a virtue. Next step is to get the moulding attached to the cabinet and work on the feet. After that the door, then the intricate holly wood inlay. Drawers will be the last step. Will share some more at the next milestone. Summer fun is about over and it is time to get back in the shop and get busy on some projects that were interrupted earlier in the year. 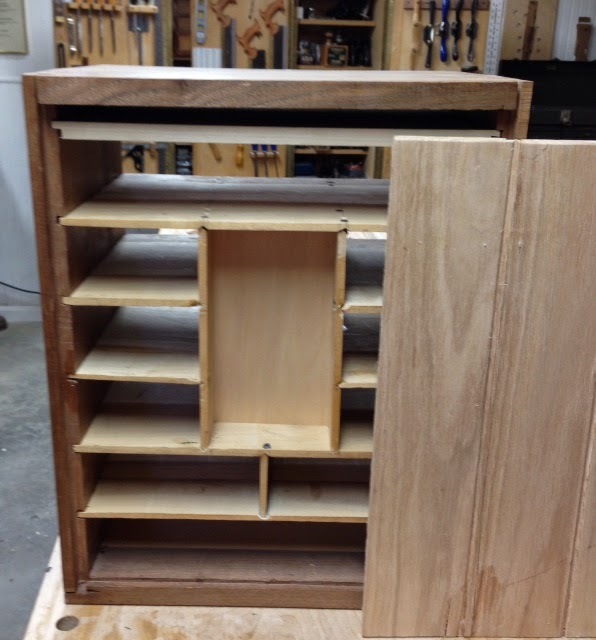 These few photos are the beginnings of a spice box following the plans by Steve Latta. Constructed of walnut with poplar as the secondary wood. 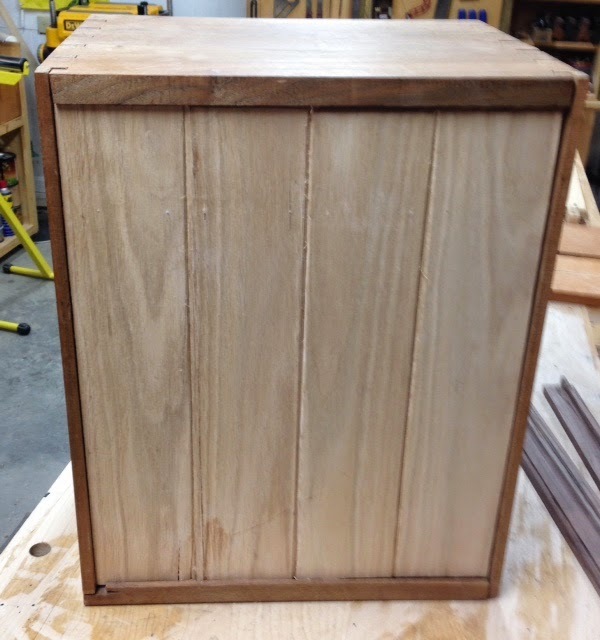 Overall size is 22"x15"x11" deep and features 11 drawers. This style chest was used among the 18th century Quakers in PA. A small chest but a ton of hand crafted details. Minimum power and maximum hand tools will be used for this project, I will post progress as it happens. Excited to get this one going. The chest features a number of hidden compartments such as the slot at the top used to store documents. There is a false back to the center drawer for example, accessed by lifting the back panel and so forth. Another feature of this box is the line and berry inlay on the door. 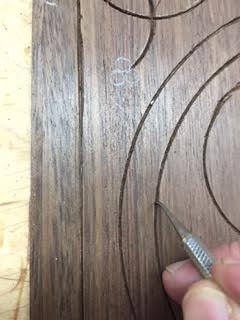 Very thin Holly strips are used for this and the grooves are all cut by hand as well. Hopefully when it is all said and down mine will look as good as the finished product shown above. A Wedding Ceremony box, something I was not aware existed until I was asked to make this as a wedding gift. During the ceremony, the bride and groom place two glasses, a bottle of wine, and two letters in the box. The top is secured any number of ways, and it opened at a some predetermined time, 1, 5, 10 years and so on. The wedding invitation was printed by Steam Whistle Letterpress, Main St. OTR, Cincinnati, OH, and inlaid in the top, covered with no glare glass and captured with a thin oak frame. 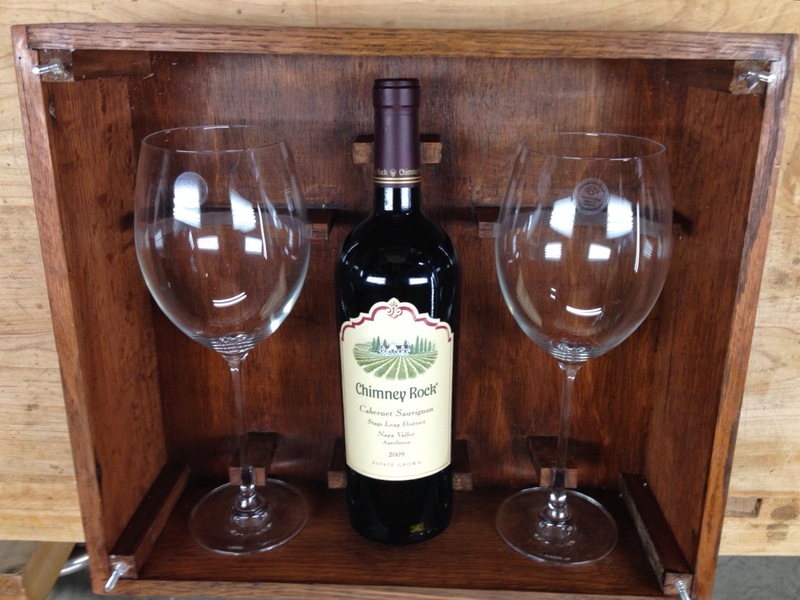 The glasses and bottle rest in support cradles designed specifically to fit each. 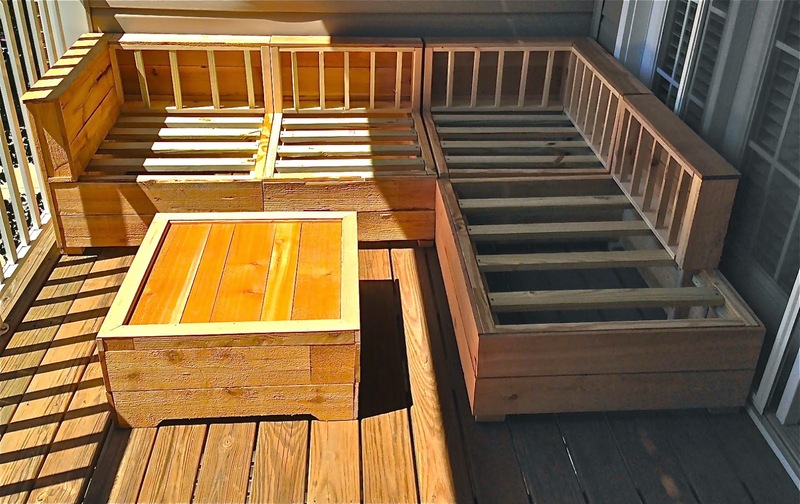 The cradles are lined with thin craft foam. Top is secured with a brass ball on each corner. This box is constructed from reclaimed oak estimated to be over 100 years old. 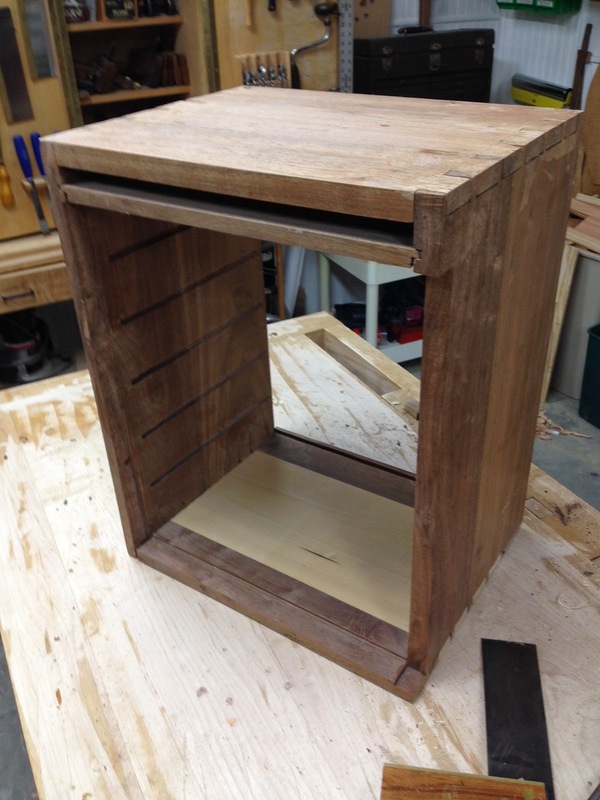 A coat of General Finishes Shaker Maple and antique brown wax to highlight the grain. Inside the top are foam pads for the glasses and since the bottle will be stored upside down, a small block with foam to keep the bottle from tipping forward. A sectional sofa for a condo deck. 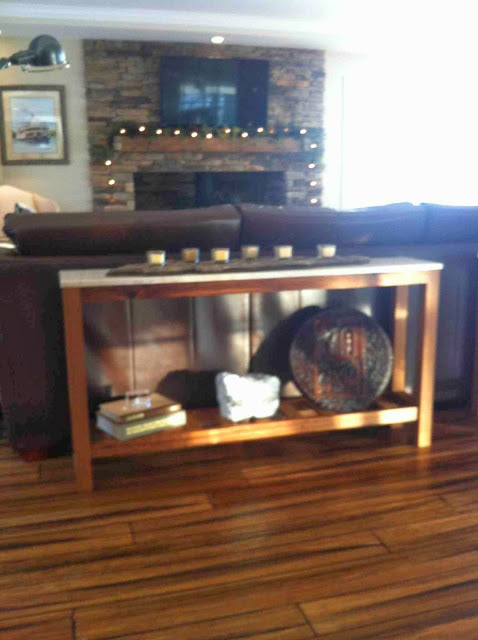 I was asked by Uptown Interiors in Warsaw, KY to build the framework for a clients sofa. 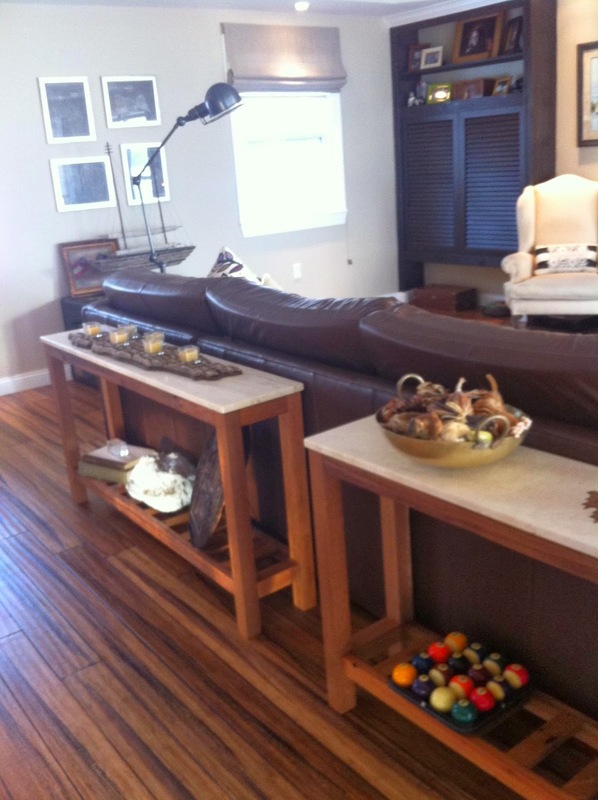 The ottoman can double as a table, or have a cushion on top. Cedar on all of the exposed areas left to age naturally. This was a "design as you go" project. Uptown made the cushions and she will finish the deck in the a beach theme requested by her client. The frame work I used standard construction grade material and covered the "show" sides, including the backs, with cedar. No finish as the cedar will age naturally. Units are 30" x 30" by 25" high (in the back), the unit closest to the door is 38". The ottoman will double as a table with the cushion removed. Finished tables in clients home- 55" x 11" x29"
Her main request was she wanted reclaimed wood. With some help from a couple of contacts, I located some reclaimed quarter sawn white oak from a guy in SE Indiana who tears down barns and not only sells the lumber, but produces some outstanding furniture from it. Most of what he has is 100 to 150 years old from barns and other buildings in the SE Indiana, Northern Kentucky, and the SW Ohio area. The other requirement was a marble, slate, or limestone top. The tops you see are marble from a vendor in Madison, IN. 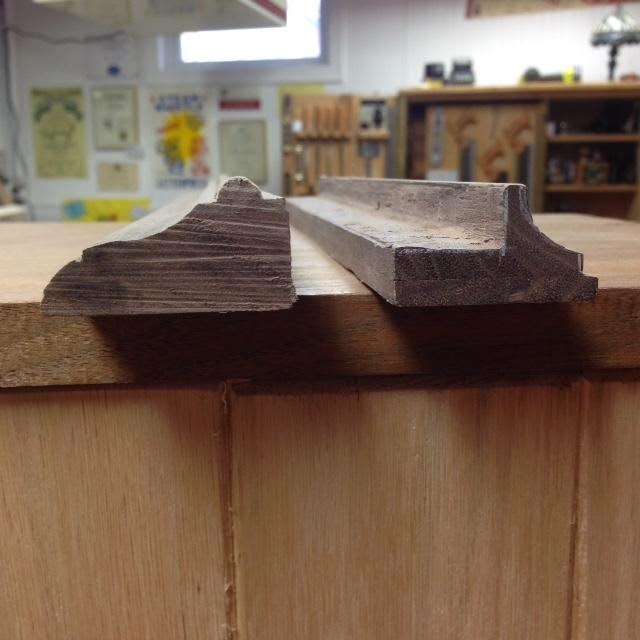 A good part of this entire build was making the mortise and tenon joinery. The rails shown above are for the lower shelf, 4 required. The finish on the wood is two coats of Tried & True Danish Oil. This really brought out the character of this wood. I really enjoyed working with this reclaimed lumber. Hard to explain but this reclaimed white oak seem to cut a lot easier than the kiln dried material I am used to and the "defects", nail holes, worm tracks, knots etc, made it look all that much better. 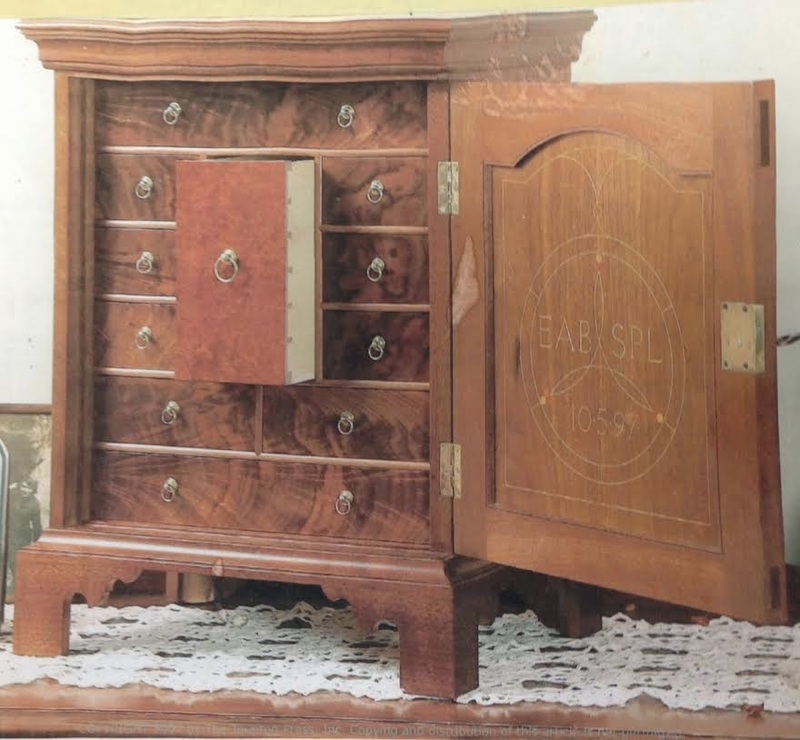 Working wood for over 20 years with an interest in styles of furniture. 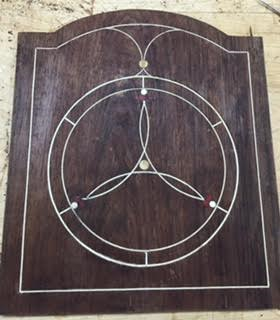 Using a combination of hand and power tools but as time goes on, hand tools are being used more and more as my confidence increases with each project. The First Light Shop is the place I will be able to spend more time as retirement has now replaced the day to day grind after 31 years and I'm looking forward to it. Please contact me if you have any questions regarding my projects or if you are interested in having me build you item that will become a family heirloom.